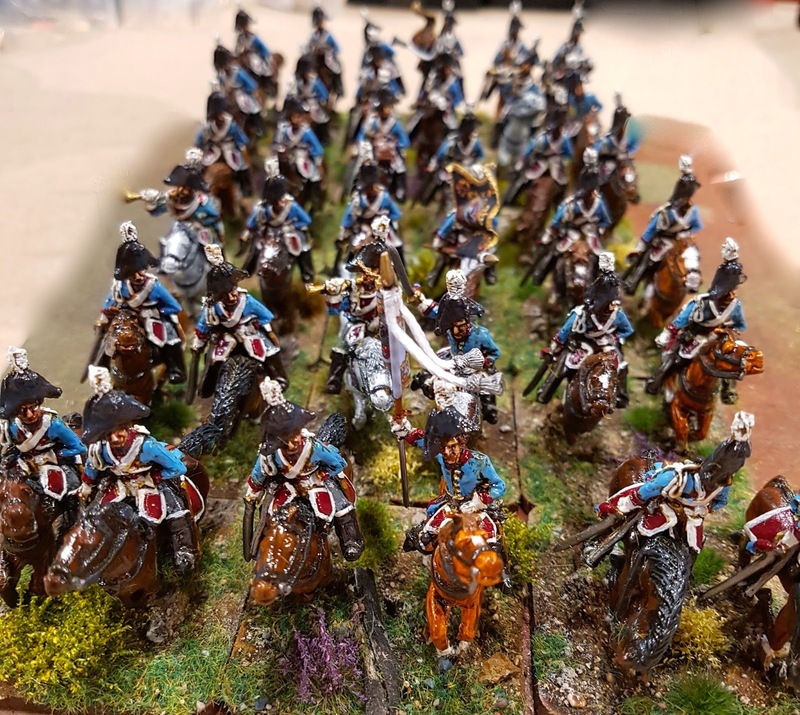 Today's offering off the basing production line is the Prussian Dragoon Regiment No 5 using Elite Miniatures (flags by Adolfo Ramos). These didn't seem to take as long to do; an hour last night sanding and daubing some brown wash over the sand to give it a darker hue then another hour this evening highlighting, applying static grass and a few tufts. Yes, "my name is Colin Ashton and I'm a tuftaholic!" It makes sense as I used to be a workaholic in the day and I probably got very close to going beyond having an unhealthy relationship with booze, but nowadays I get my kicks of (legal) prescription painkillers! I have to say that I really am pleased with the way this unit has turned out. Barry (aka The Flash) painted the figures for me and I did the basing and between our efforts I reckon we have a winning partnership! 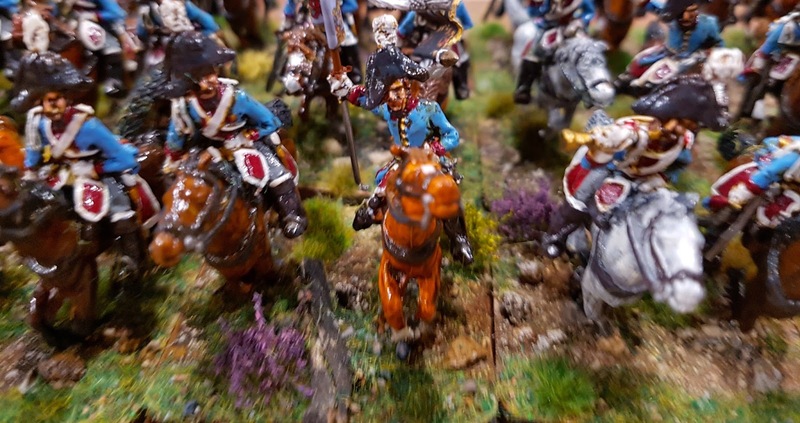 That as they say is the last of my Prussian cavalry (apart from those I don't yet have of course, i.e. when I bring the cuirassiers up to 30 figures). I've also just completed my eight-gun horse artillery battery (four models) and this evening glued and sanded the bases of three Prussian infantry battalions, so progress is being maintained. In fact I'm running perilously short of sand (good job builders still here). Very nice once again Colin. I have 24 of these in my lead pile awaiting at least some form of effort and crying out for a simple undercoat! As you know I adore Elite Napoleonic's but I do wish Peter had sculpted just a bit more variety in to some of the earlier ranges cavalry. Besides the Officer, standard bearer and trumpeter they are all generally the same pose and I lack the skill to cut and solder bits and pieces on to achieve it. I agree. They do have a certain 70s charm which i like. He doesn't even do a standard bearer for the cuirassier or dragoons. I too am all thumbs when it comes to converting stuff.